INFORMATION IN THE TABLE BELOW AND ON THE FOLLOWING PAGES MAY BE USEFUL IN ANSWERSING THE QUESTIONS IN THIS SECTION OF THE EXAMINATION. During the reaction above, the product yield can be increased by increasing the temperature of the reaction. Why is this effective? (A) The reaction is endothermic; therefore adding heat will shift it to the right. (B) Increasing the temperature increases the speed of the molecules, meaning there will be more collisions between them. (C) The reactants are less massive than the products, and an increase in temperature will cause their kinetic energy to increase more than that of the products. (D) The increase in temperature allows for a higher percentage of molecular collisions to occur with the proper orientation to create the product. The above equation represents the reaction between the base methylamine (Kb = 4.38 × 10−4) and water. 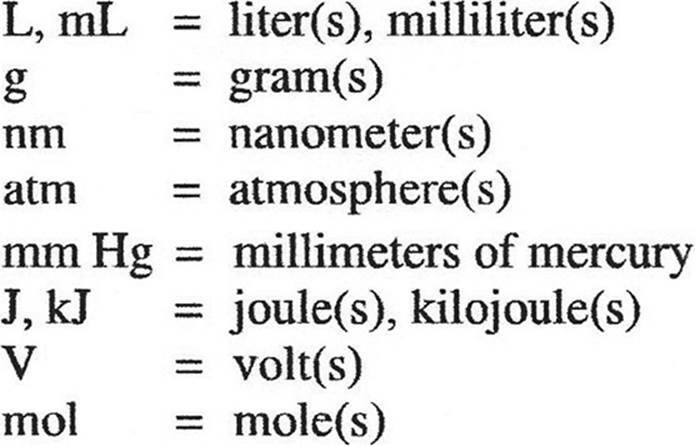 Which of the following best represents the concentrations of the various species at equilibrium? 3. The following diagram shows the relative atomic sizes of three different elements from the same period. Which of the following statements must be true? (A) The effective nuclear charge would be the greatest in element X. (B) The first ionization energy will be greatest in element X. (C) The electron shielding effect will be greatest in element Z. 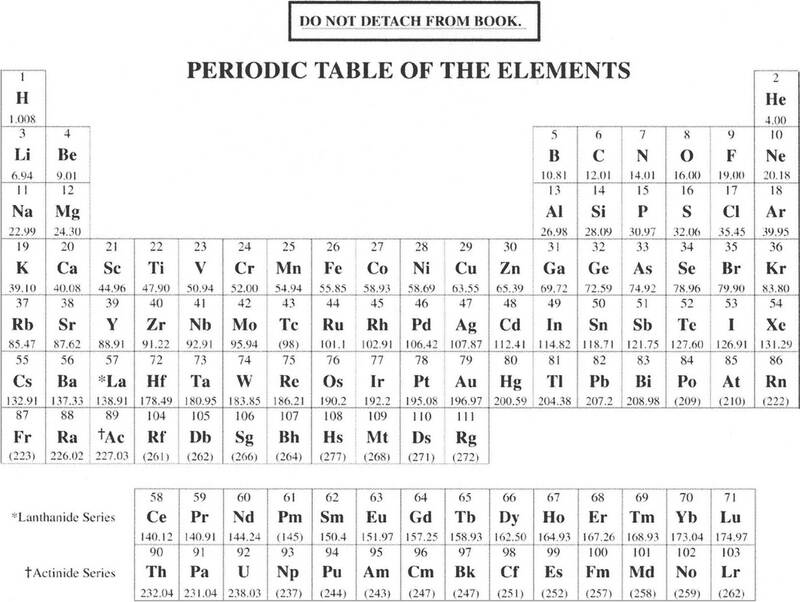 (D) The electronegativity value will be greatest in element Z. 4. A sealed, rigid container contains three gases: 28.0 g of nitrogen, 40.0 g of argon, and 36.0 g of water vapor. If the total pressure exerted by the gases is 2.0 atm, what is the partial pressure of the nitrogen? 5. A sample of liquid NH3 is brought to its boiling point. Which of the following occurs during the boiling process? 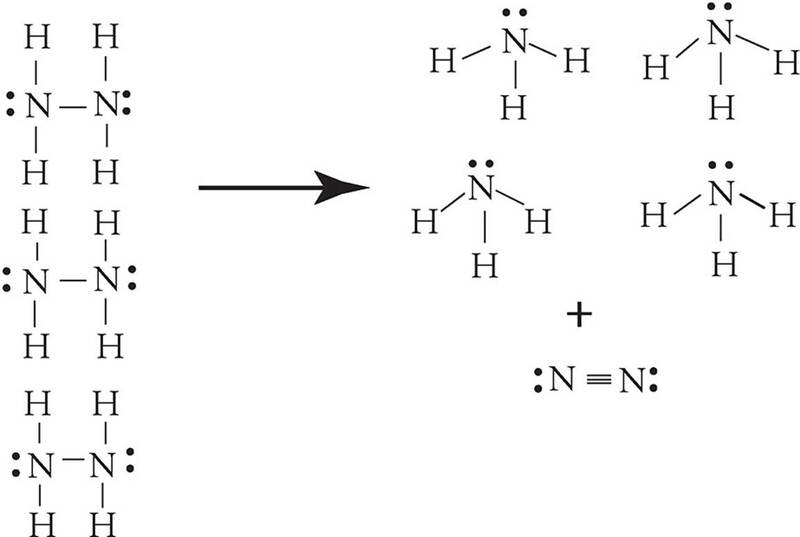 (A) The N-H bonds within the NH3 molecules break apart. 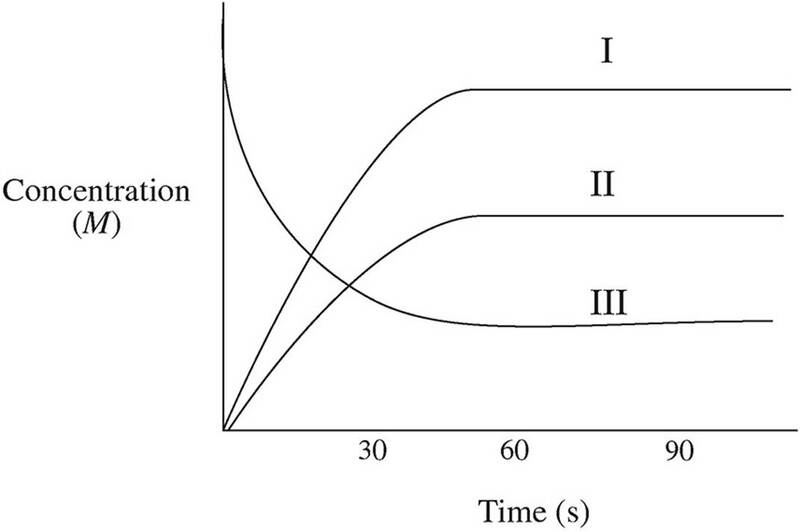 (B) The overall temperature of the solution rises as the NH3 molecules speed up. (C) The amount of energy within the system remains constant. (D) The hydrogen bonds holding separate NH3 molecules together break apart. Questions 6-10 refer to the following. 6. Correctly identify the anode and cathode in this reaction as well as where oxidation and reduction are taking place. 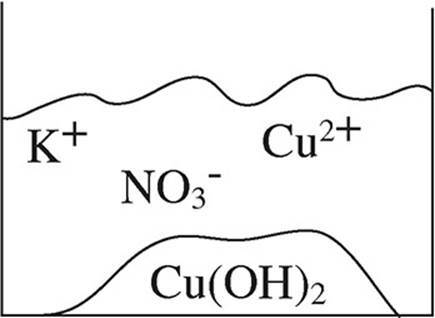 (A) Cu is the anode where oxidation occurs, and Zn is the cathode where reduction occurs. 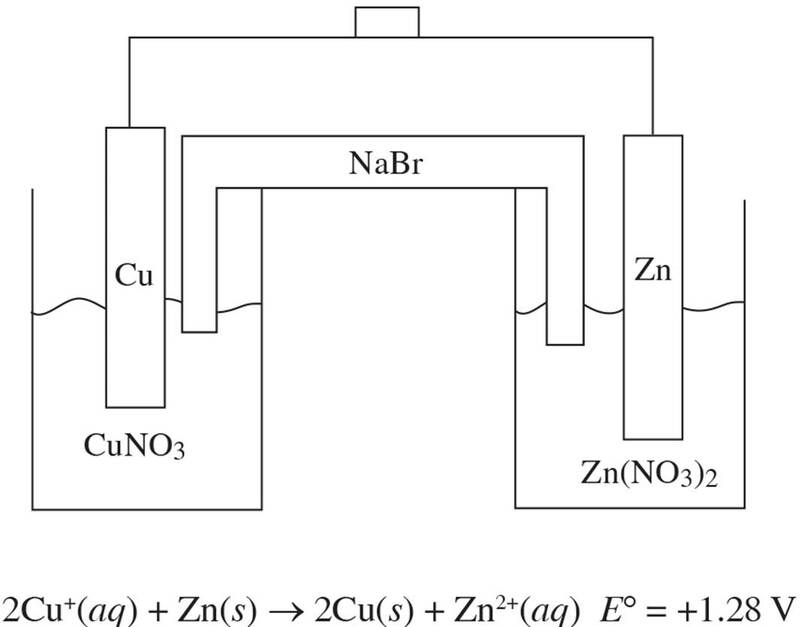 (B) Cu is the anode where reduction occurs, and Zn is the cathode where oxidation occurs. 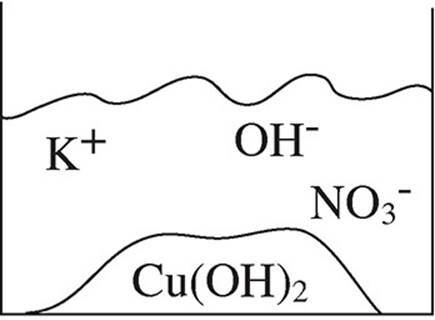 (C) Zn is the anode where oxidation occurs, and Cu is the cathode where reduction occurs. (D) Zn is the anode where reduction occurs, and Cu is the cathode where oxidation occurs. 7. How many moles of electrons must be transferred to create 127 g of copper? 8. If the Cu+ + e− → Cu(s) half reaction has a standard reduction potential of +0.52 V, what is the standard reduction potential for the Zn2+ + 2e− → Zn(s) half reaction? 9. As the reaction progresses, what will happen to the overall voltage of the cell? (A) It will increase as [Zn2+] increases. (B) It will increase as [Cu+] increases. (C) It will decrease as [Zn2+] increases. (D) The voltage will remain constant. 10. What will happen in the salt bridge as the reaction progresses? 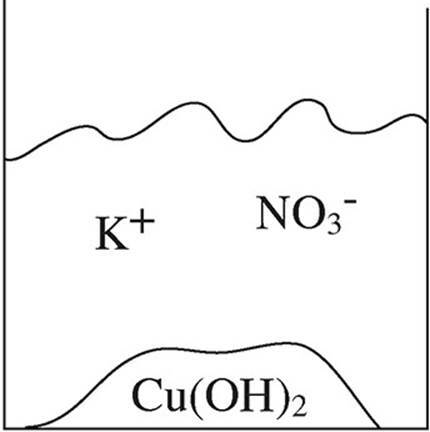 (A) The Na+ ions will flow to the Cu/Cu+ half-cell. 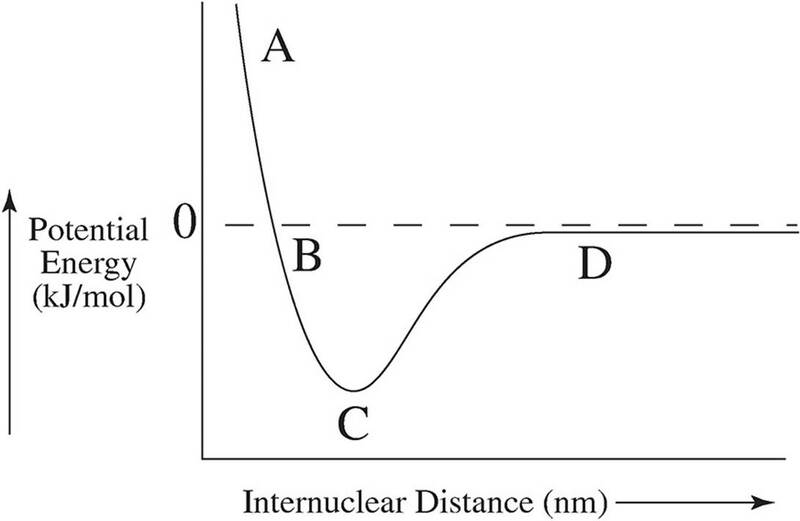 (B) The Br− ions will flow to the Cu/Cu+ half-cell. (C) Electrons will transfer from the Cu/Cu+ half-cell to the Zn/Zn2+ half-cell. (D) Electrons will transfer from the Zn/Zn2+ half-cell to the Cu/Cu+ half-cell. 11. For a reaction involving nitrogen monoxide inside a sealed flask, the value for the reaction quotient (Q) was found to be 1.1 × 102 at a given point. If, after this point, the amount of NO gas in the flask increased, which reaction is most likely taking place in the flask? 12. Which of the following substances has an asymmetrical molecular structure? 14. Nitrogen’s electronegativity value is between those of phosphorus and oxygen. Which of the following correctly describes the relationship between the three values? (A) The value for nitrogen is less than that of phosphorus because nitrogen is larger, but greater than that of oxygen because nitrogen has a greater effective nuclear charge. (B) The value for nitrogen is less than that of phosphorus because nitrogen has fewer protons but greater than that of oxygen because nitrogen has less valence electrons. (C) The value for nitrogen is greater than that of phosphorus because nitrogen has less electrons, but less than that of oxygen because nitrogen is smaller. (D) The value for nitrogen is greater than that of phosphorus because nitrogen is smaller, but less than that of oxygen because nitrogen has a smaller effective nuclear charge. 15. A sample of a compound known to consist of only carbon, hydrogen, and oxygen is found to have a total mass of 29.05 g. If the mass of the carbon is 18.02 g and the mass of the hydrogen is 3.03 g, what is the empirical formula of the compound? Questions 16-18 refer to the following. 16. In addition to OH−, what species are present in the solution during section III of the graph? 17. What is the magnitude of the first dissociation constant? 18. 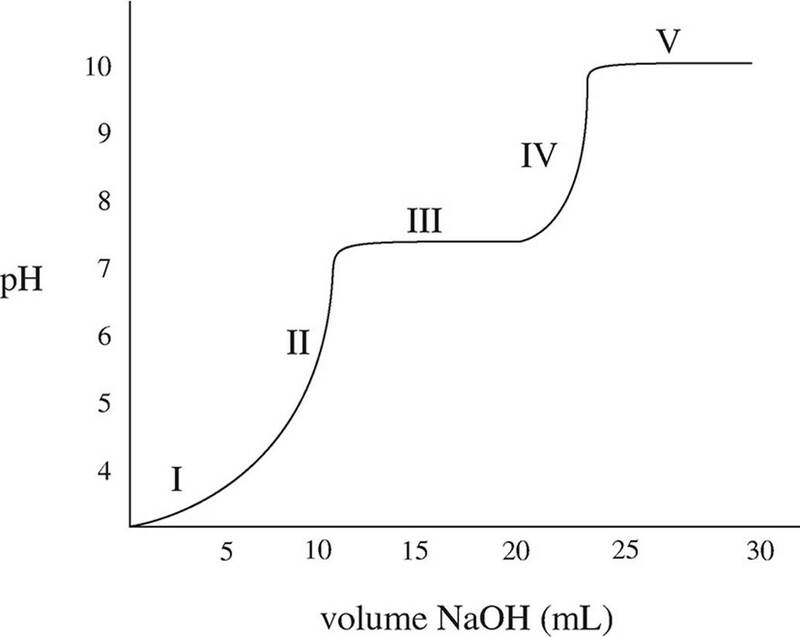 If the concentration of the sodium hydroxide is increased prior to repeating the titration, what effect, if any, would that have on the graph? 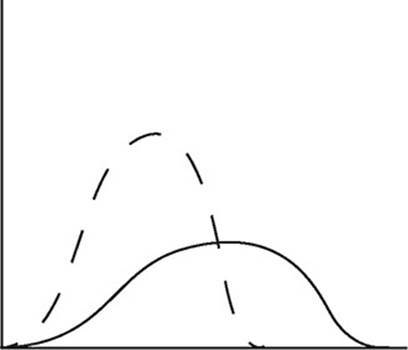 (A) The graph would not change at all. (B) The pH values at the equivalence points would increase. (C) The equivalence points would be reached with less volume of NaOH added. (D) The slope of the equivalence points would decrease. 19. 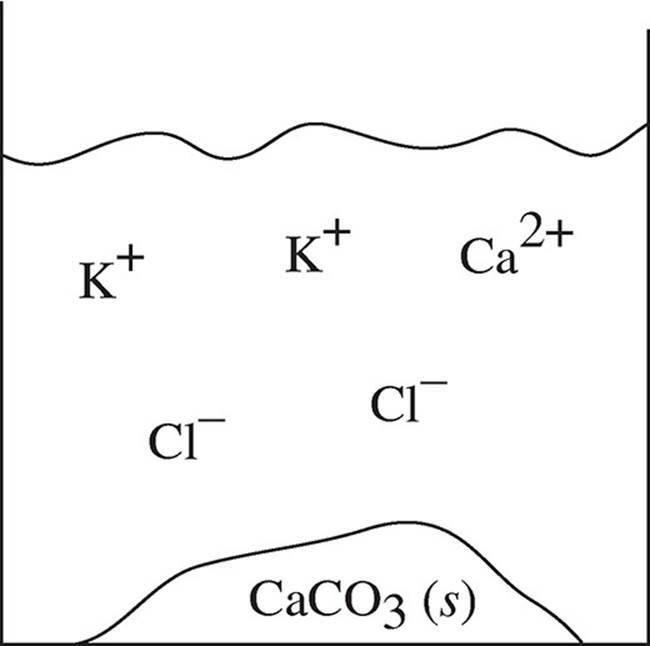 Two solutions of potassium carbonate and sodium chloride are mixed together, and the particulate representation below shows what is present after the reaction has gone to completion. 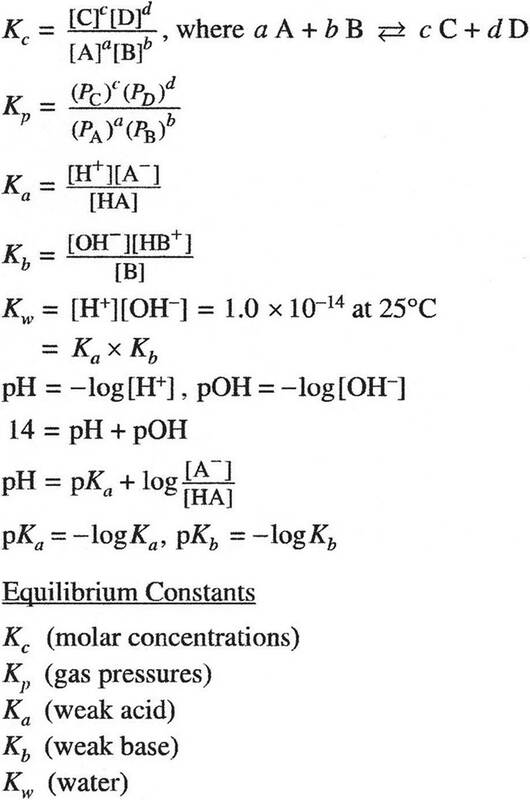 Which of the two original solutions is the limiting reagent and why? 20. 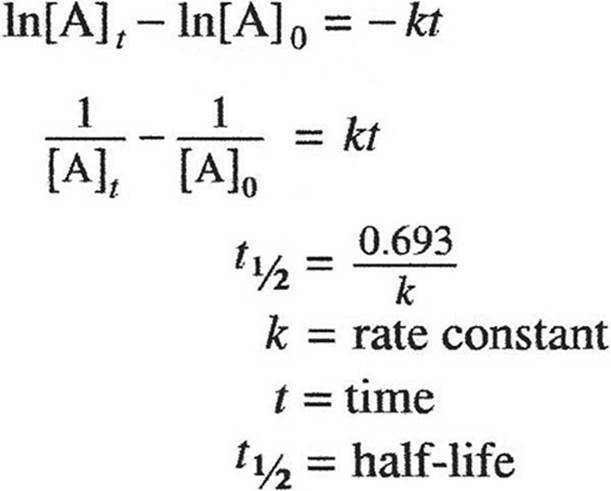 In which of the following circumstances is the value for Keq always greater than 1? Which would be a stronger acid, and why? 22. During a chemical reaction, NO(g) gets reduced and no nitrogen-containing compound is oxidized. Which of the following is a possible product of this reaction? 23. Which of the following pairs of substances would make a good buffer solution? Questions 24-27 refer to the following. Inside a calorimeter, 100.0 mL of 1.0 M hydrocyanic acid (HCN), a weak acid, and 100.0 mL of 0.50 M sodium hydroxide are mixed. The temperature of the mixture rises from 21.5 °C to 28.5 °C. The specific heat of the mixture is approximately 4.2 J/g°C, and the density is identical to that of water. 24. Identify the correct net ionic equation for the reaction that takes place. 25. What is the approximate amount of heat released during the reaction? 26. As ∆T increases, what happens to the equilibrium constant and why? (A) The equilibrium constant increases because more products are created. (B) The equilibrium constant increases because the rate of the forward reaction increases. (C) The equilibrium constant decreases because the equilibrium shifts to the left. (D) The value for the equilibrium constant is unaffected by temperature and will not change. 27. If the experiment is repeated with 200.0 mL of 1.0 M HCN and 100. mL of 0.50 M NaOH, what would happen to the values for ∆T and ∆Hrxn? 28. The following diagrams show the Lewis structures of four different molecules. Which molecule would travel the farthest in a paper chromatography experiment using a polar solvent? 29. The first ionization energy for a neutral atom of chlorine is 1.25 MJ/mol and the first ionization energy for a neutral atom of argon is 1.52 MJ/mol. How would the first ionization energy value for a neutral atom of potassum compare to those values? (A) It would be greater than both because potassium carries a greater nuclear charge then either chlorine or argon. (B) It would be greater than both because the size of a potassium atom is smaller than an atom of either chlorine or argon. (C) It would be less than both because there are more electrons in potassium, meaning they repel each other more effectively and less energy is needed to remove one. (D) It would be less than both because a valence electron of potassium is farther from the nucleus than one of either chlorine or argon. 30. Which net ionic equation below represents a possible reaction that takes place when a strip of magnesium metal is oxidized by a solution of chromium (III) nitrate? 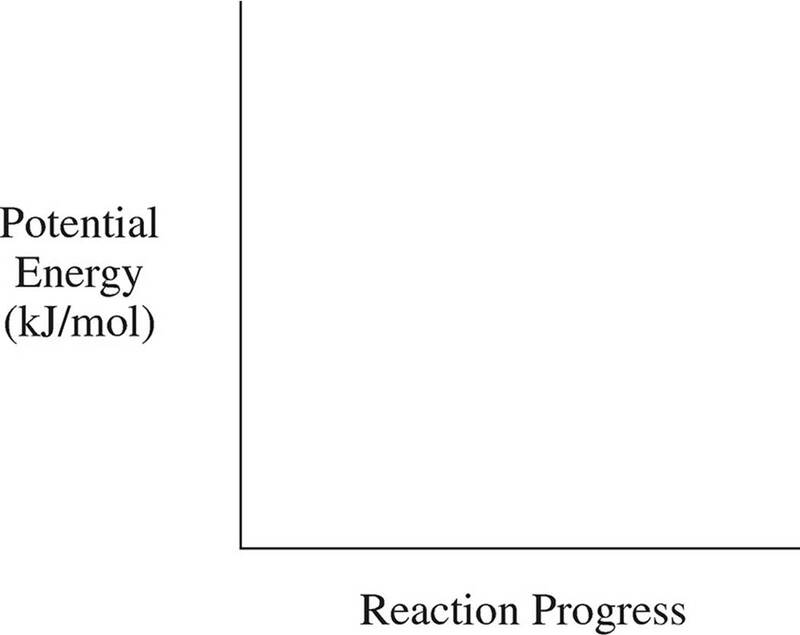 In which of the following ways could the reaction above be manipulated to create more product? 32. A pure solid substance is heated strongly. It first melts into a liquid, then boils and becomes a gas. 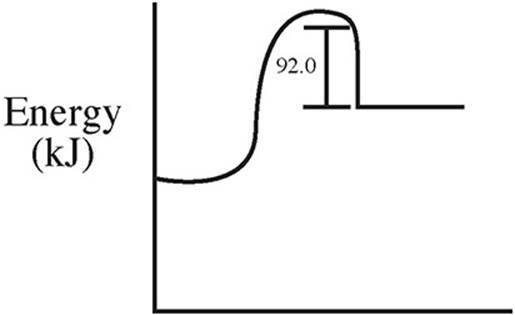 Which of the following heating curves correctly shows the relationship between temperature and heat added? 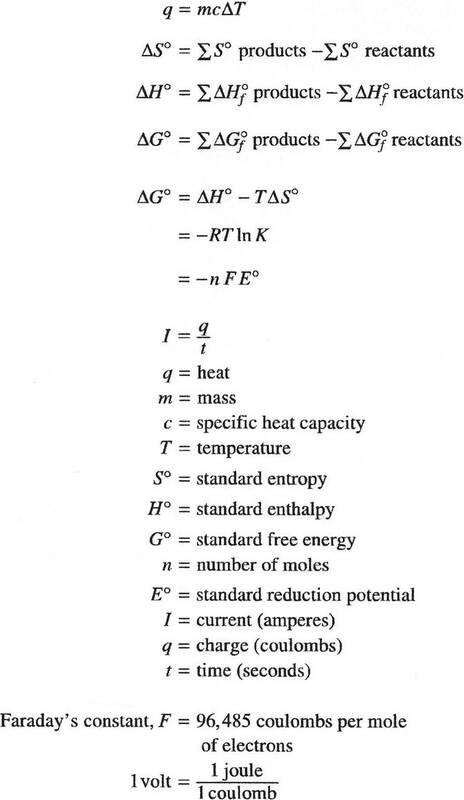 Which of the following is true regarding the thermal energy in this system? (A) It is transferred from the surroundings to the reaction. (B) It is transferred from the reaction to the surroundings. (C) It is transferred from the reactants to the products. (D) It is transferred from the products to the reactants. 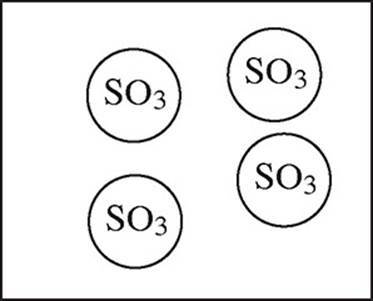 At 600 K, SO2Cl2 will decompose to form sulfur dioxide and chlorine gas via the above equation. 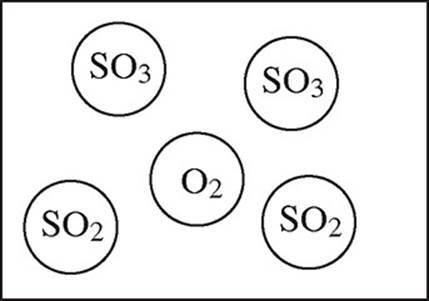 If the reaction is found to be first order overall, which of the following will cause an increase in the half life of SO2Cl2? Questions 35-38 refer to the following reaction. 4.0 mol of gaseous SO2 and 6.0 mol of O2 gas are allowed to react in a sealed container. 35. Which particulate drawing best represents the contents of the flask after the reaction goes to completion? 36. What percentage of the original pressure will the final pressure in the container be equal to? 37. At a given point in the reaction, all three gases are present at the same temperature. Which gas molecules will have the highest velocity and why? (D) Molecules of all three gases will have the same speed because they have the same temperature. 38. 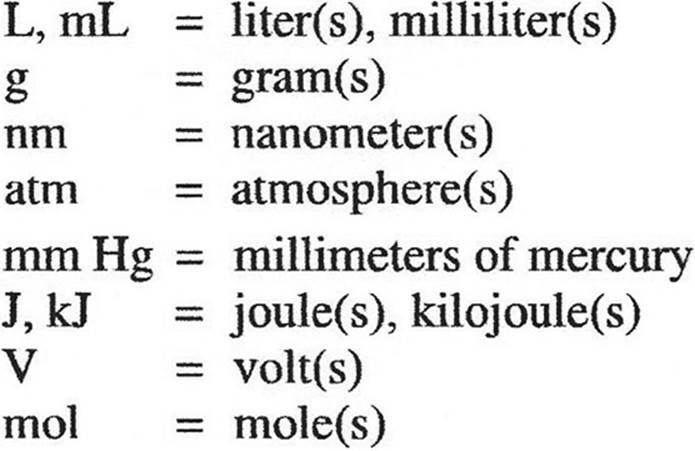 Under which of the following conditions would the gases in the container most deviate from ideal conditions and why? 39. Four different acids are added to beakers of water, and the following diagrams represent the species present in each solution at equilibrium. Which acid has the highest pH? 40. Which expression below should be used to calculate the mass of copper that can be plated out of a 1.0 M Cu(NO3)2 solution using a current of 0.75 A for 5.0 minutes? 41. Lewis diagrams for the nitrate and nitrite ions are shown below. Choose the statement that correctly describes the relationship between the two ions in terms of bond length and bond energy. (A) Nitrite has longer and stronger bonds than nitrate. (B) Nitrite has longer and weaker bonds than nitrate. (C) Nitrite has shorter and stronger bonds than nitrate. (D) Nitrite has shorter and weaker bonds than nitrate. 42. 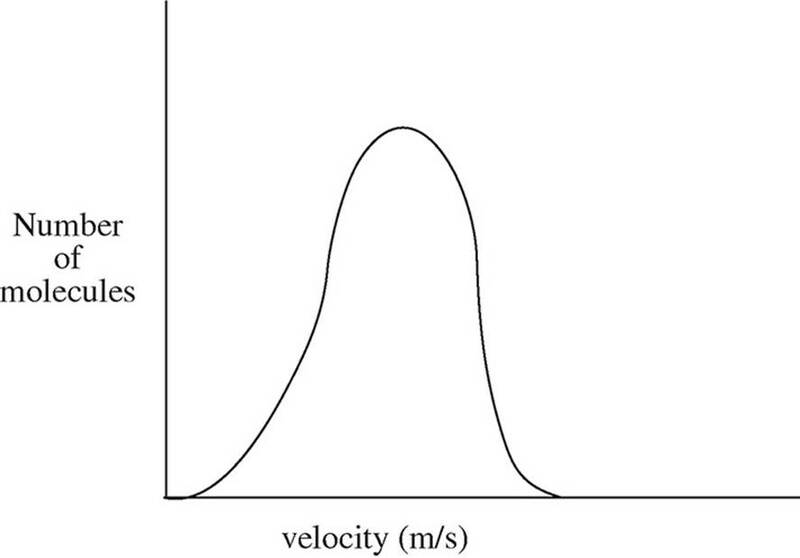 Examining data obtained from mass spectrometry supports which of the following? 43. A 2.0 L flask holds 0.40 g of helium gas. If the helium is evacuated into a larger container while the temperature is held constant, what will the effect on the entropy of the helium be? (A) It will remain constant as the number of helium molecules does not change. (B) It will decrease as the gas will be more ordered in the larger flask. (C) It will decrease because the molecules will collide with the sides of the larger flask less often than they did in the smaller flask. (D) It will increase as the gas molecules will be more dispersed in the larger flask. Questions 44-48 refer to the following. 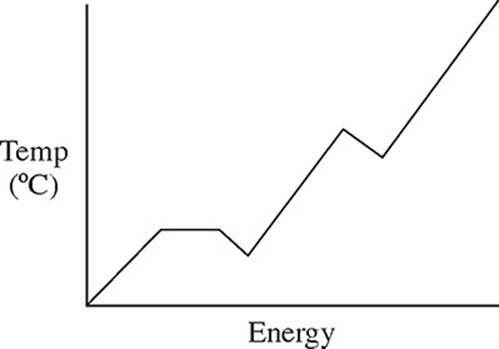 The graph below indicates the change in concentration for each species over time. 44. Using the numbers of the lines on the graph, identify which line belongs to which species. 45. What is happening to the rate of the forward reaction at t = 60 s? (C) It is remaining constant. 46. As the reaction progresses, what happens to the value of the equilibrium constant Kp if the temperature remains constant? 47. 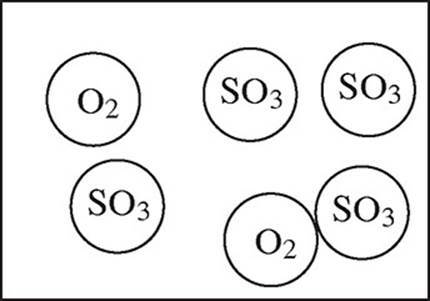 What would happen to the slope of the NO2 line if additional O2 were injected into the container? (A) It would increase, then level off. (B) It would decrease, then level off. (C) It would remain constant. (D) It would increase, then decrease. 48. 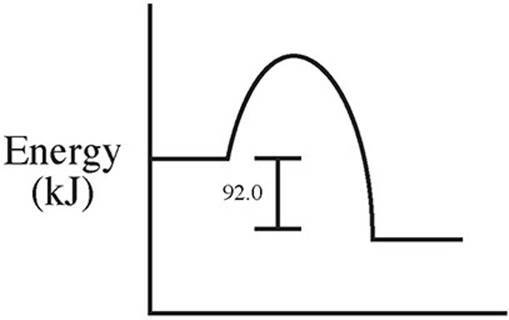 Using the graph, how could you determine the instantaneous rate of disappearance of NO2 at t = 30 s? What is the order of the overall reaction? 50. Starting with a stock solution of 18.0 M H2SO4, what is the proper procedure to create a 1.00 L sample of a 3.0 M solution of H2SO4 in a volumetric flask? (A) Add 167 mL of the stock solution to the flask, then fill the flask the rest of the way with distilled water while swirling the solution. (B) Add 600 mL of the stock solution to the flask, then fill the flask the rest of the way with distilled water while swirling the solution. (C) Fill the flask partway with water, then add 167 mL of the stock solution, swirling to mix it. Last, fill the flask the rest of the way with distilled water. (D) Fill the flask partway with water, then add 600 mL of the stock solution, swirling to mix it. Last, fill the flask the rest of the way with distilled water. 51. 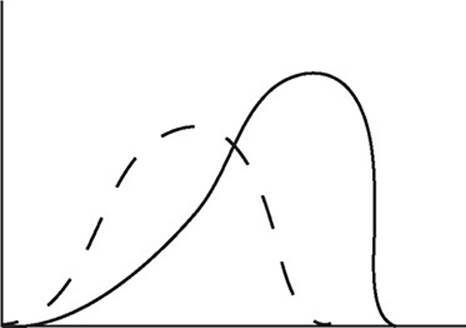 The reaction shown in the following diagram is accompanied by a large increase in temperature. If all molecules shown are in their gaseous state, which statement accurately describes the reaction? (A) It is an exothermic reaction in which entropy increases. 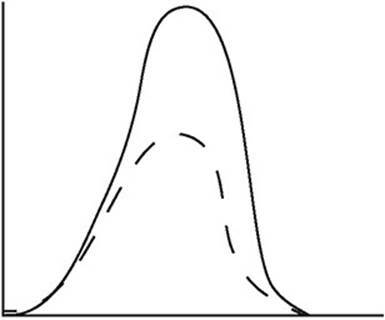 (B) It is an exothermic reaction in which entropy decreases. (C) It is an endothermic reaction in which entropy increases. 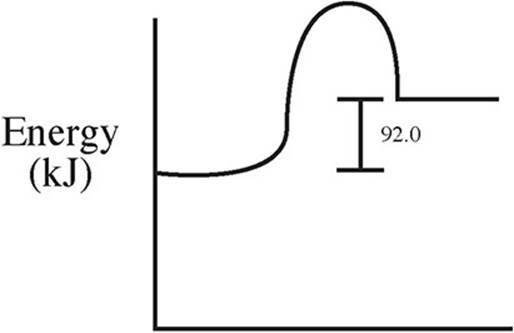 (D) It is an endothermic reaction in which entropy decreases. 52. 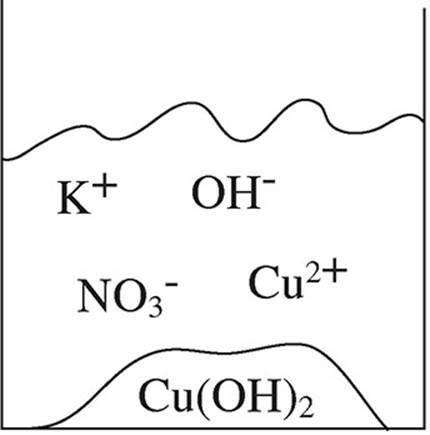 A student mixes equimolar amounts of KOH and Cu(NO3)2 in a beaker. 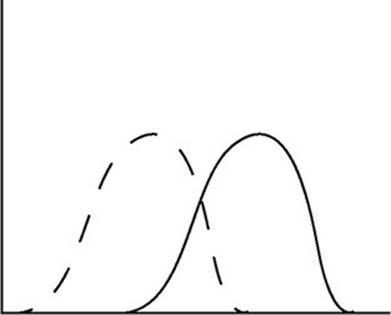 Which of the following particulate diagrams correctly shows all species present after the reaction occurs? Questions 53-55 refer to the following. 53. Based on the strength of the intermolecular forces in each substance, estimate from greatest to smallest the vapor pressures of each substance in liquid state at the same temperature. 54. When in liquid state, which two substances are most likely to be miscible with water? 55. Between propane and ethene, which will likely have the higher boiling point and why? The above reaction will experience a rate increase by the addition of a cataylst such as platinum. Which of the following best explains why? (A) The catalyst increases the overall frequency of collisions in the reactant molecules. (B) The catalyst increases the frequency of collisions that occur at the proper orientation in the reactant molecules. (C) The catalyst introduces a new reaction mechanism for the reaction. (D) The catalyst increases the activation energy for the reaction. 57. 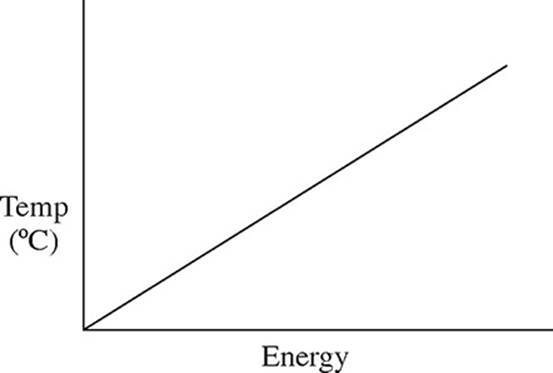 The graph below shows the amount of potential energy between two hydrogen atoms as the distance between them changes. 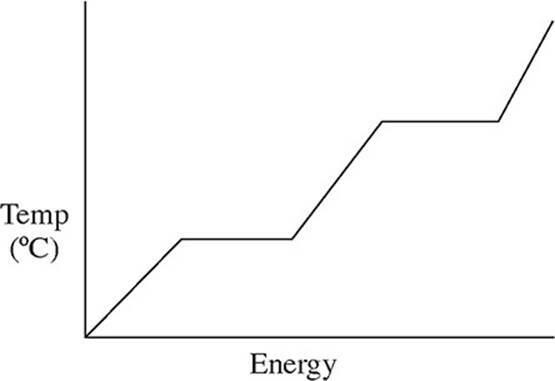 At which point in the graph would a molecule of H2 be the most stable? For the equilibrium above, what would happen to the value of ∆G° if the concentration of N2 were to increase and why? (A) It would increase as the reaction would become more thermodynamically favored. (B) It would increase as the reaction would shift right and create more products. (C) It would decrease because there are more reactants present. (D) It would stay the same because the value of Keq would not change. 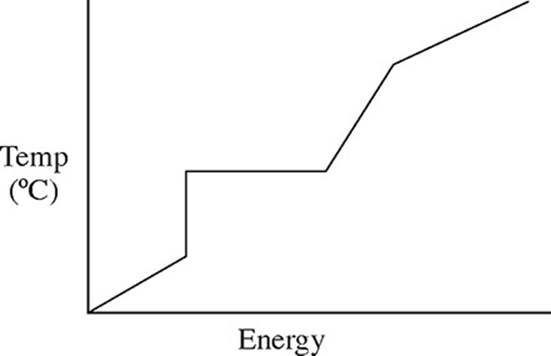 Which of the following energy level diagrams gives an accurate representation of the above reaction? 60. 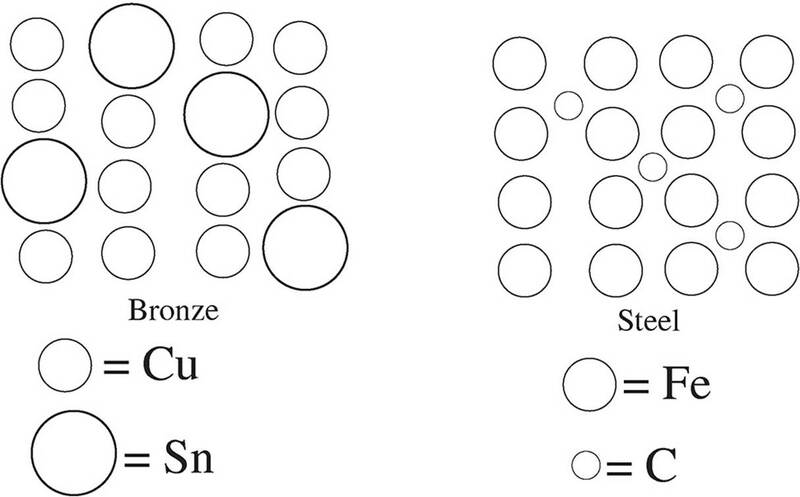 Two alloys are shown in the diagrams below—bronze, and steel. Which of the following correctly describes the malleability of both alloys compared to their primary metals? (A) Bronze’s malleability would be comparable to that of copper, but steel’s malleability would be significantly lower than that of iron. (B) Bronze’s malleability would be significantly higher than that of copper, but steel’s malleability would be comparable to that of iron. (C) Both bronze and steel would have malleability values similar to those of their primary metals. (D) Both bronze and steel would have malleability values greater than those of their primary metals. 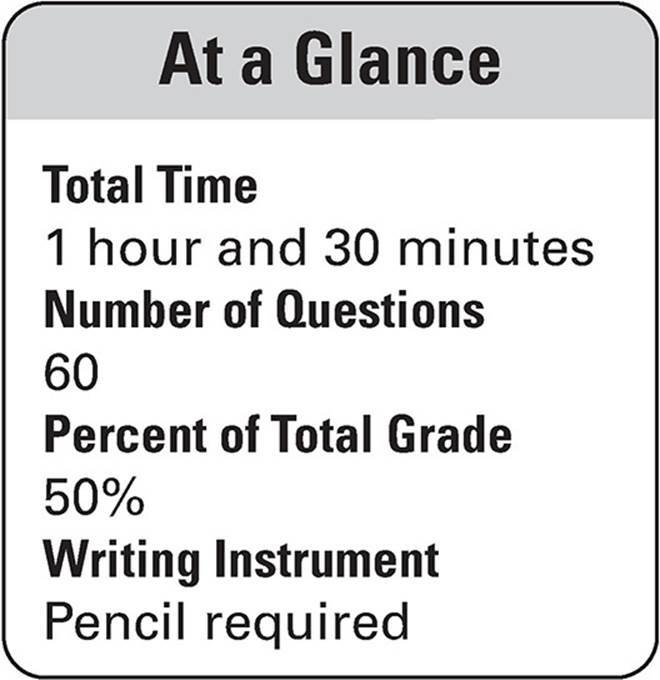 INFORMATION IN THE TABLE BELOW AND ON THE FOLLOWING PAGES MAY BE USFUL IN ANSWERSING THE QUESTIONS IN THIS SECTION OF THE EXAMINATION. 1. A student is tasked with determining the identity of an unknown carbonate compound with a mass of 1.89 g. The compound is first placed in water, where it dissolves completely. The Ksp value for several carbonate-containing compounds are given below. 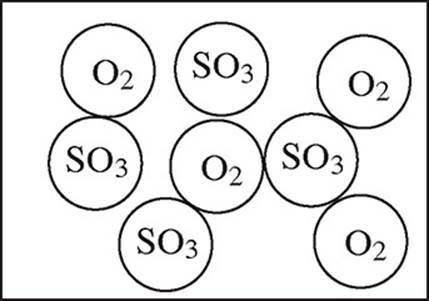 (a) In order to precipitate the maximum amount of the carbonate ions from solution, which of the following should be added to the carbonate solution: LiNO3, Ni(NO3)2, or Sr(NO3)2? Justify your answer. (b) For the carbonate compound that contains the cation chosen in part (a), determine the concentration of each ion of that compound in solution at equilibrium. (c) When mixing the solution, should the student ensure the carbonate solution or the nitrate solution is in excess? Justify your answer. (d) After titrating sufficient solution to precipitate out all of the carbonate ions, the student filters the solution before placing it in a crucible and heating it to drive off the water. After several heatings, the final mass of the precipitate remains constant and is determined to be 2.02 g.
(i) Determine the number of moles of precipitate. (ii) Determine the mass of carbonate present in the precipitate. 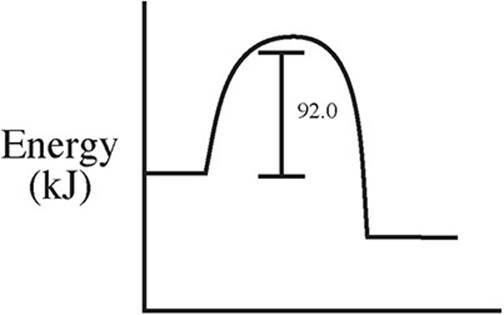 (e) Determine the percent, by mass, of carbonate in the original sample. (f) Is the original compound most likely lithium carbonate, sodium carbonate, or potassium carbonate? Justify your answer. (b) What is the balanced net ionic equation? (d) (i) If 15.55 mL of permanganate are added to reach the endpoint, what is the initial concentration of the iron (II) sulfate? (ii) The actual concentration of the FeSO4 is 0.250 M. Calculate the percent error. (e) Could the following errors have led to the experimental result deviating in the direction that it did? You must justify your answers quantitatively. (i) 55.0 mL of FeSO4 was added to the flask prior to titration instead of 50.0 mL. (ii) The concentration of the potassium permanganate was actually 0.160 M instead of 0.150 M.
The standard entropy of formation values for the varying substances are listed in the table below. (a) Calculate the entropy value for the overall reaction. Several bond enthalpies are listed in the table below. (b) Calculate the enthalpy value for the overall reaction. (c) Is this reaction thermodynamically favored at 25°C? Justify your answer. (i) Will energy be released or absorbed? 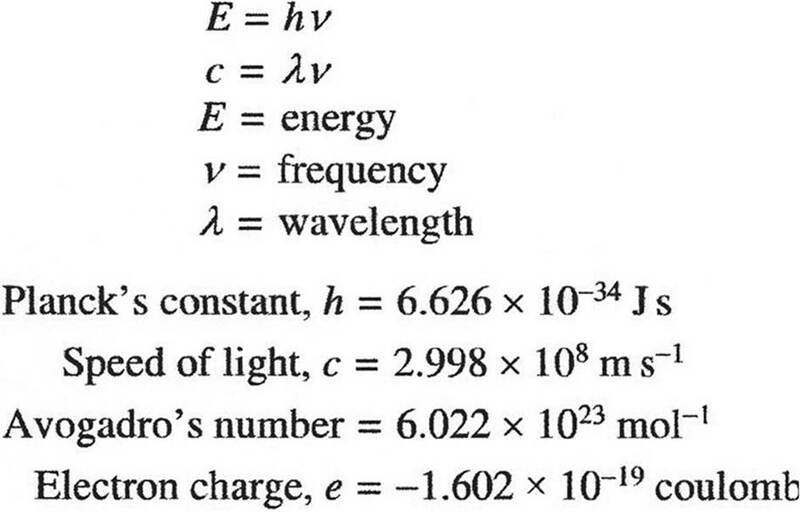 (ii) What is the magnitude of the energy change? (e) On the reaction coordinates below, draw a line showing the progression of this reaction. Label both DH and Ea on the graph. 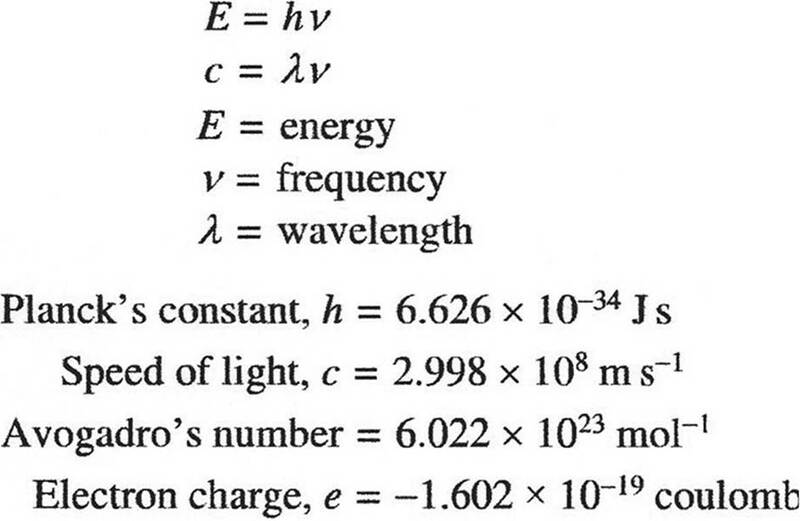 (a) Using formal charge, determine which structure is the most likely correct structure. (i) What is the hybridization around the atom? (ii) How many sigma and pi bonds has the atom formed? (c) A hydrogen ion attaches itself to the the acetyl ion, creating C2H4O. Draw the Lewis diagram of the new molecule. (a) The three acids are known to be HCl, H2SO4, and H3PO4. Identify which sample is which acid. Justify your answer. (b) The HCl solution is then titrated with a 0.150 M solution of the weak base methylamine, CH3NH2. (i) Write out the net ionic equation for this reaction. (ii) Determine the pH of the solution after 20.0 mL of methylamine has been added. 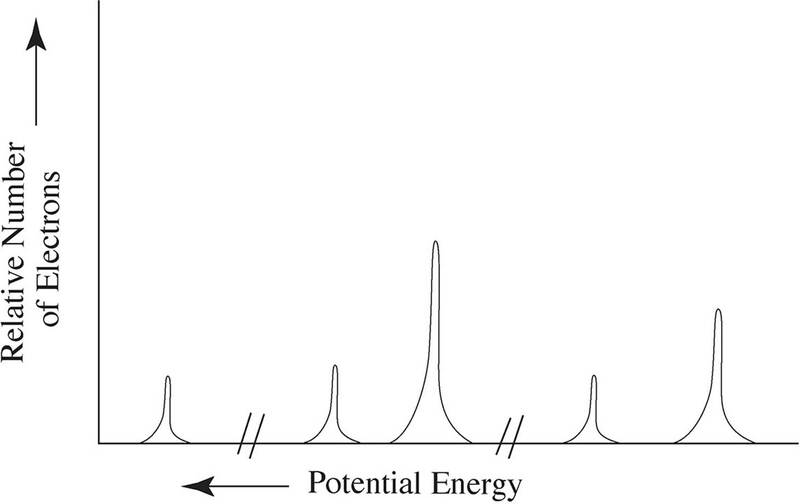 (a) Identify the element this spectra most likely belongs to and write out its full electron configuration. (a) (i) What is the equation for the overall reaction? (ii) Identify any catalysts or intermediates from the reaction mechanism. (i) Which elementary step is the slowest one? Justify your answer. 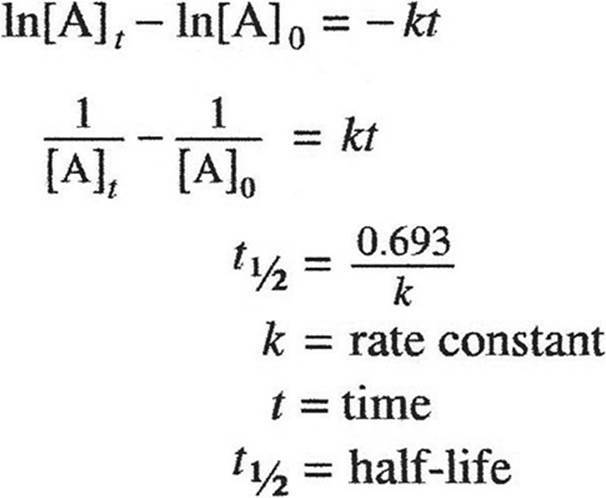 (ii) If the reaction is measured over the course of several minutes, what would the units of the rate constant be?